Frame and panel doors most recently are used to describe wood or vinyl entry sets. 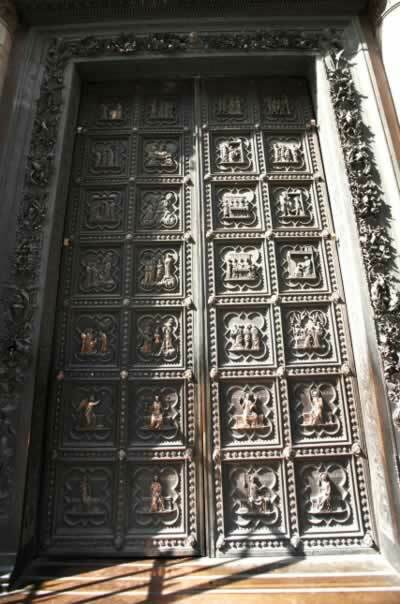 But metal frame doors with cast-metal panels of copper, tin, and trace elements of lead stretch back before the Italian Renaissance. The exquisite double-leaf door in this photo celebrates 28 scenes with characters in stunning bas-relief. Baroque metal castings set in the columns and header (architrave) of the decorative molding completes the theme. Each 14-panel metal door is fortified by panel rails, metal edges, and raised ornaments. Wood headers require painting and routine maintenance, while the metal doors require routine inspection and replacement of worn locksets, strike plates, hinges, gasketing or weather stripping. Depending on the age of the door, it may require metal polishing or electroplating. Doors, frames, and mullions can also be painted.